Axis Direct is of the few Full services brokers in India with 3-in-1 account. 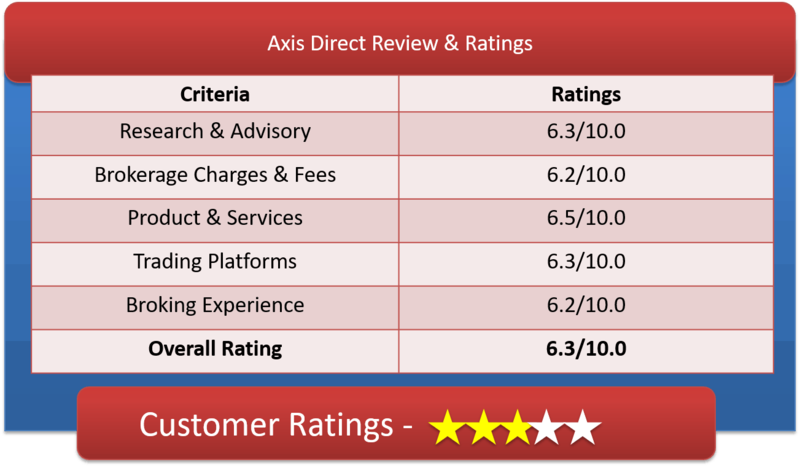 Lets have a detailed review of Axis Direct Demat Account, Axis Direct brokerage charges, Axis bank trading platforms & other features. Axis Securities Limited is a subsidiary of Axis Bank. The Broker covers membership in NSE, BSE, MCX-SX, and Depository Participant with CDSL. The main stream business of the broker is to allow investing in Equities, MF, SIPs, IPOs, Derivatives, Bonds, NCDs, Exchange Traded Funds and Company Fixed Deposits. Broker’s collaboration with the Bank, gives them platform for marketing of Axis Bank’s products offerings such as – Home and auto Loans, Personal Loans, Loan Against Property, Loan Against Shares and Loans for SME etc. Axisdirect gives you facility of 3-in-1 – which is Axis Bank Savings Account, Axis Securities Trading Account and Axis Direct Demat Account. Axis securities has network of 75 branches across India. They have a demo center as well to get an understanding of the various Axis Direct product. For easy customer care you can contact them through email, SMS, a visit to branches or using ‘Write to us’, which we find to be of great help for their clients. Axis Direct provides quality research by the expertise of Enam. It also provides access to research providers like Reuters, The Screener and Recognia to help you make informed and wiser decisions. Axis direct offers NRI Trading Account as well to Invest in Equities, Initial Public Offerings, gold ETFs, Mutual Funds and Futures & Options. For online trading, Axis Direct has 2-plans to offer to its clients. AxisDirect has two plan to offer to its clients. Fixed Plan: Its .50% for equity trades is slightly less expensive than ICICI (.55%) while same as Kotak Securities, HDFC and SBI Securities (.50%). Intraday is cheaper at .05% which is cheaper than ICICI, HDFC and at par with Kotak, Reliance and Religare. Future trade at .05% is also competitive. Variable Plan: This is a variable brokerage plan depending upon your trading volume requirement. The more is your volume of trade the lower the brokerage. Equity brokerage ranges from 0.60% to 0.20%. Option brokerage ranges from Rs 95 to Rs 65. Intraday and Future brokerage ranges from 0.05% to 0.03%. Zero Rs. Option Trading – 1 paisa per lot options trading if squared off on the same day, Rs 10 per lot when carrying the position f/w. Why Open Axis Direct Demat Account? Axis Securities offers Customized Screener, Candle stick Charting, Alert Engine, Watchlist, Stock Comparator to identify investment opportunities. Axis direct offers all possible ways of trading like -terminal based, web based and mobile app based trading platform to its clients. But there is software usage charges that client has to bear to use the trading software like DirectTrade and SwiftTrade. This is fast trading EXE based installable application that can be easily downloaded. Features like fast execution of orders with real time monitoring, live streaming quotes, auto refreshing, multiple market watch, charting etc makes it highly attractive. This software can be used only after by paying Rs 2999 yearly or Rs 1599 half yearly, which we find to be too expensive. Real time quotes, multiple watch-lists, quick access to research reports, faster order executions and access to live intraday trading calls are few of the features of Swift Trade. This software can be used by paying Rs 299 quarterly which we find to be comfortable to user’s pocket. AxisDirect Mobile App gives you precision to trade smartly on phone while you are on the go. This is a lighter trading platform that can be used at a slower internet connection. Especially good for people on the move. For more detail review of mobile app and download please visit Axis Direct Mobile App. AxisDirect is a platform to promote all their products and offer trading in equity and Derivative segment. The Broker is backed up by the Bank which is also a plus and Broker also offer NRI Services. So overall a one stop solution for all your trading needs but at a cost higher than Discount Brokers.